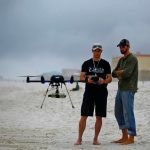 To understand the mechanisms that move water-borne objects or contaminants onshore, over 30 researchers from 16 universities gathered in Ft. Walton Beach, Florida last month – armed with drifters, dye, and drones – and conducted a three-week Surfzone Coastal Oil Pathways Experiment (SCOPE). Scientists are tracking elusive ocean processes to visualize the movement of Gulf waters in 3D. 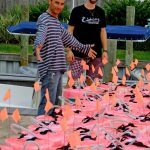 For this experiment, they deployed 250 GPS-equipped drifters (30 were biodegradable) to track surface waters, using a “release and catch” method for repeated use of these specially-outfitted devices. 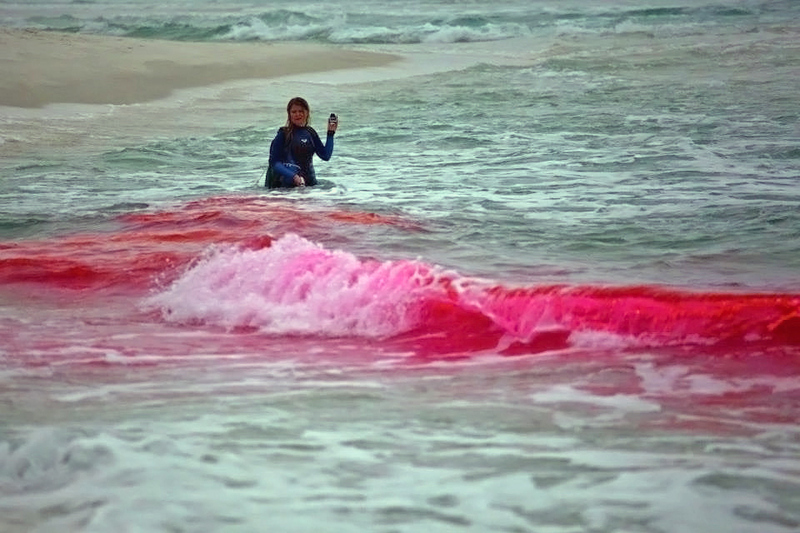 Researchers injected an EPA-approved dye both along and outside the surf zone to trace its movement through the water column. Various in-situ instruments recorded water and atmospheric conditions. These researchers are members of the Consortium for Advanced Research on Transport of Hydrocarbon in the Environment (CARTHE), a science team funded by the Gulf of Mexico Research Initiative (GoMRI). The University of Miami’s Rosenstiel School of Marine and Atmospheric Science (UM-RSMAS) administers CARTHE under Özgökmen’s direction. Joining Reiners as co-lead scientist for SCOPE is Jamie MacMahan with the Naval Postgraduate School. 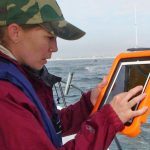 To construct data on the multiple factors that influence the behavior of ocean currents, the scientists have to collect data at one time. 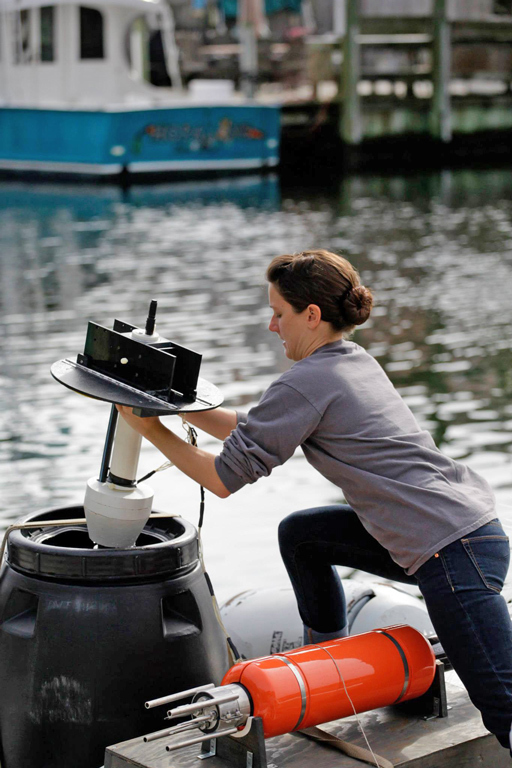 “We combine a lot of different instruments at once to capture the complete picture of all the drivers of surface currents,” explained SCOPE team member Guillaume Novelli, a UM-RSMAS postdoctoral fellow. “It took a village to pull off SCOPE successfully,” said Özgökmen referring to the many dedicated staff who coordinated logistics, people, equipment, and, of course, the science. 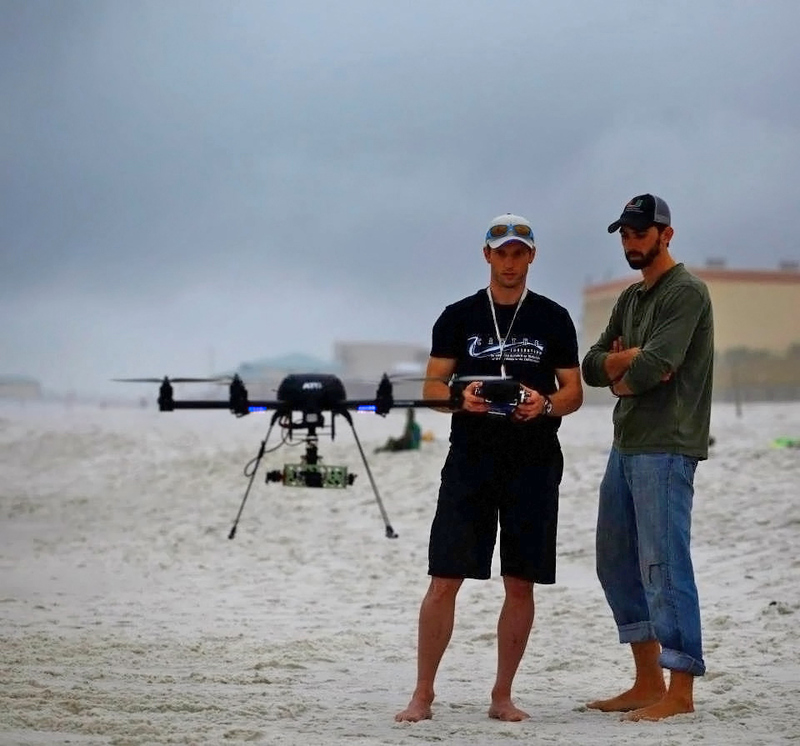 Prior to the SCOPE execution in Ft. Walton Beach, about 15 modelers from three distinct groups – University of Miami Coupled Model (UMCM), Naval Research Laboratory (NRL), and ADvanced CIRCulation model (ADCIRC) – began running real-time, predictive simulations. Together these models provided SCOPE scientists with important, high-resolution transport information. 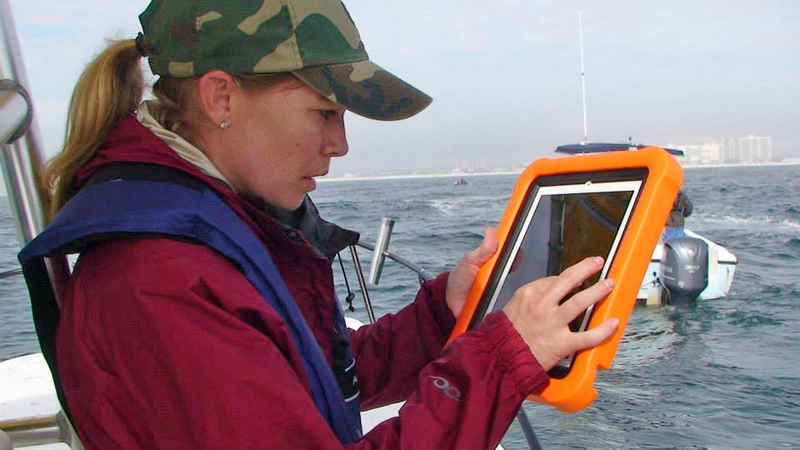 The first week of SCOPE was a flurry of preparations: teams finalized local permits, assembled drifters and identified specific locations for launching (freshwater inlets, surf zones, and along the inner shelf and fronts) and then staged them for deployment; others prepared dye injection equipment and assembled camera-equipped drones and kites; and divers positioned observing instruments in the water at various distances from the beach and depths in the water column. The Florida International University team erected a meteorological data-gather tower on site. The next week, the team ran test trials of the experiments to make final adjustments for local conditions, aerial observations and imagery, and to inform their remote modeling teams. Scientists also hosted on-site interactive demonstrations with local middle and high school students. In the final week, everyone, in a synchronized manner, executed their tasks of well-informed, targeted releases of dye and deployment of drifters with the coordinated use of Synthetic-aperture radar (SAR) images, microstructure and air-sea interaction measurements, observations of frontal features, and detailed modeling adjusted to observations. Once models are supplemented by real-time data from experiments, climate scientists can combine these data with wind and tides and use them to predict oil transport in scenarios under a variety of conditions. In the long-term, improved transport predictions can inform environmental policy and support the development of crisis response plans. The U.S. Coast Guard can use improved transport predictions to pinpoint vessels in distress and with search and rescue operations, and fisheries can better understand larval movement of important commercial species. SCOPE is the second large CARTHE experiment that brings together a wide range of scientific experts to experiment with measurement methods and study oil transport. CARTHE conducted their first experiment, GLAD (Grand LAgrangian Deployment), near the Deepwater Horizon site in the summer of 2012. 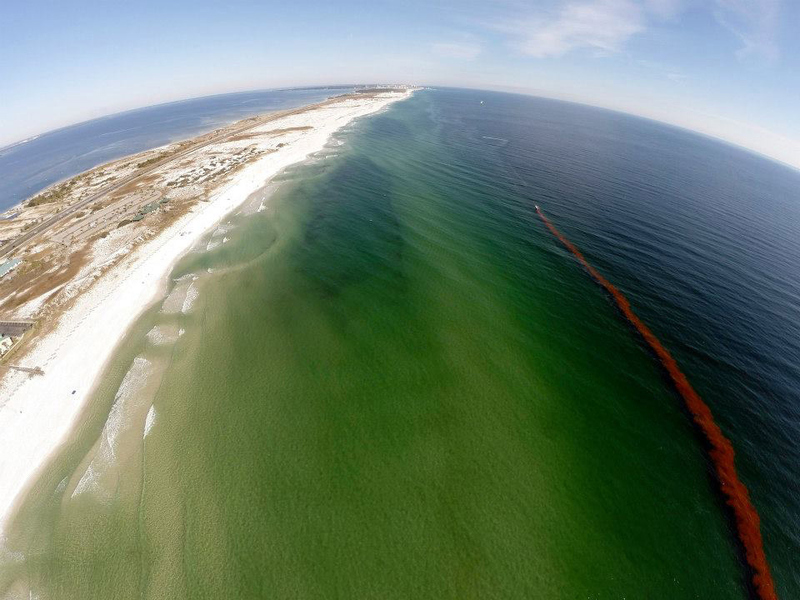 Scientists will use data from both experiments to more accurately model the transport and fate of oil in the Gulf. Read about last year’s GLAD experiment: CARTHE at Sea: A Grand Experiment for Transformative Research in Gulf Oil Studies and Follow the Journey of CARTHE Drifters in the Gulf and Five Million Data Points and Counting and Drifters in Path of Hurricane Isaac Provide New Insights on Ocean Currents. The CARTHE program includes 26 principal investigators from 12 research institutions in eight states. Together these scientists are engaged in novel research through the development of a suite of integrated models and state-of-the-art computations that bridge the scale gap between existing models and natural processes. For more information about CARTHE, please visit www.carthe.org.